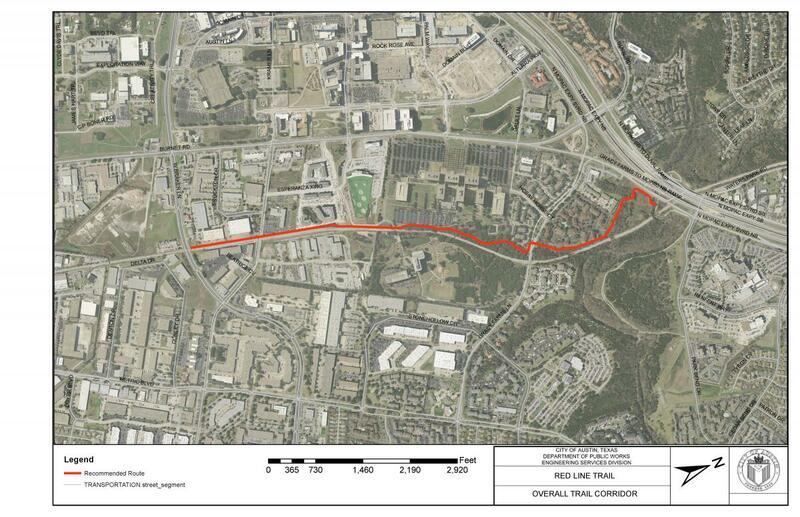 Funded by the 2016 Mobility Bond, the Red Line Trail will connect Braker Lane and the CapMetro Kramer Red Line Station to the existing Northern Walnut Creek trail system. The trail location is from Northern Walnut Creek Trail to Braker along the Red Line Rail. Funding has been provided for the Preliminary Engineering Report (PER) and design of this trail. Currently, staff is finalizing the PER. The PER evaluates all the environmental constraints of the project including: topography, drainage, various soil types, tree canopy, wildlife habitat, floodplain, surrounding land uses, location of utilities, cultural assessments, critical environmental features, endangered species, property ownership, as well as several other elements. The image below shows the recommended trail route. Click to view a larger map. Fall 2017 Preliminary Engineering Report Meet with community members, stakeholders and land owners. Execute preliminary feasibility studies, gather data regarding topographic, natural and other elements of potential trail connections. Fall 2020 Final Design and Permitting Staff will finalize design of the trail and begin permitting process. Summer 2021 Project bidding Project will go out to bid for construction. Winter 2022 Construction Trail construction begins. The project team hosted the first public meeting on December 13, 2017 to get community feedback. This feedback informed the recommendations we presented in February 2019. View the meeting presentation from the first public meeting. The project team hosted the second public meeting on February 21, 2019. The purpose of this meeting was to share recommendations for Red Line Trail and get feedback. See meeting boards about Red Line Trail recommendations. See the Feb. 21 public meeting presentation. See a flyover rendering video and a pathway rendering video that show the recommendations for Red Line Trail. Sign up to receive updates about this trail.